My daughter’s started food and nutrition lessons at school. They can be a mixed blessing – I remember my son’s lentil curry less than fondly, not because of his cooking abilities but due to the dire recipe and we’re not big lentil fans anyway. But last week’s dessert was delicious. I also love the fact that they encourage her to adapt recipes so here’s her version of fruit crumble. Not only is it delicious but we’ve normally got the ingredients in the house so it’s great for that spur of the moment pudding fix 🙂 And it works well served on its own or with custard. Preheat the oven to 190 deg C for conventional ovens, 170 deg C for fan ovens or gas mark 5. 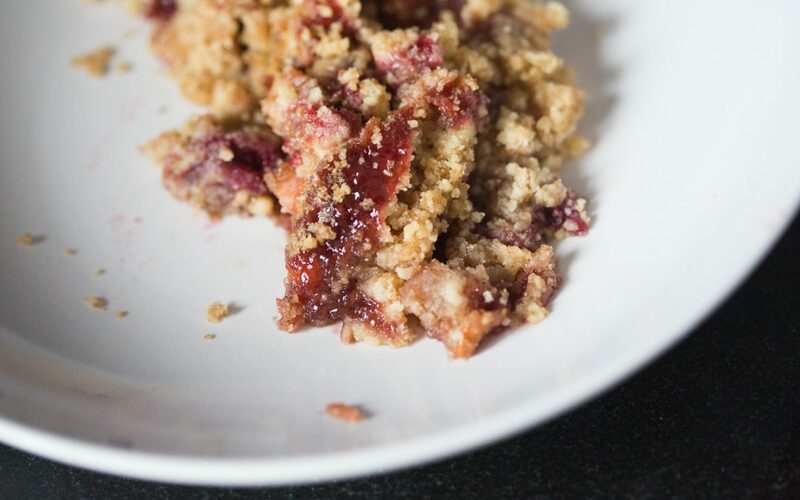 Make the crumble topping by rubbing the butter into the flour until the mixture looks like breadcrumbs. Stir 100g of the demerara sugar into the topping mixture and put to one side. Put the apples, raspberries and the remaining 50g of sugar) into the ovenproof dish and mix well. Pour the topping evenly over the fruit and press down slightly so it’s firm. Bake for 30 minutes or until the topping looks golden brown.